Fashion Shoot: Tinfoil and Plastic Wrap? After a week's hiatus, I'm back to writing in my blog. Not sure exactly what kept me from writing, other than the fact that I'm so far behind in my shoots. I thought I'd be caught up by the weekend, but I did two more shoots so I'm frantically trying to get my work finished and uploaded for all to see. A while back I wrote about originality and creativity. The shoot I took part in a few weeks ago was definitely creative, and certainly original. Fashion designer Janelle Brown had come up with some pieces she wanted to shoot including shoes and hats, but it was the stuff in between that she was really innovative with. Ellen, our model for the day was wrapped up in a foil emergency blanket and clear plastic wrap. Needless to say, she was very reflective, so lighting would need to be big. Jamiraa Berry and Jessica Lynn Wiebe did fantastic work on makeup and hair, respectively, and my assistant for the day was Michelle Olsen. Michelle is a wonderful photographer in her own right and it was awesome having her on the set to share ideas and offer help. I have more photos coming soon, but for now, enjoy these and feel free to leave a comment! The crew! Ellen in the front, Michelle on the left, Janelle on the right and me in behind with a silly expression and lots of balloons. Absent is Jamiraa Berry and Jessica Lynn Wiebe. In "angelic", "artistic", "brown", "creative", "ellen", "fashion", "hat", "high", "janelle", "key", "light", "shoes", "studio", "white"
Since being selected, the photo has (at the time of writing) been viewed over 2500 times, tweeted, liked, favorite-ed and commented on extensively. I am truly humbled to be featured on the Editor's Choice page, and I'm glad to get this photo some recognition, as it's one of the first few photos I've ever taken with Kodak Portra Film. I certainly don't think that the film is the reason the photo has done so well, but I do think that it adds a warm appeal to the photo. As usual, Scott Kelby is delivering in style. This photo is a testament to great timing, featuring dynamic lines, frozen action and the adage that if you want cool pictures, point your camera at cool stuff. "You wanna know what a cool dirt bike shot should look like? 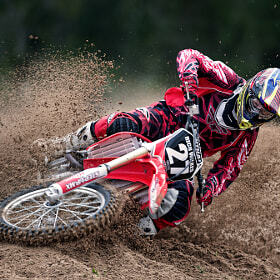 Go search 'Dirt bike' on 500px." He's never actually said this, but I can hear Scott telling someone to go do this on one of his Blind Critiques over on The Grid. 500px is a showcase for brilliant landscape work, as anyone who has visited the "Popular" section of the website will know. 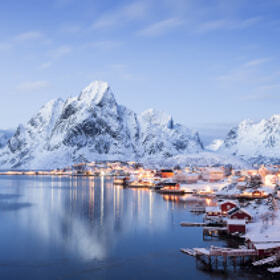 Felix Röser delivers a wonderful image of Reine, in the Lofoten Islands of Norway. I wish there was more in the foreground to add to the depth of the shot, but the composition and colours keep me very interested. I love this concept. I'm not sure how much is posed, and how much is photoshopped, but I don't really care. I even like the slightly tilted horizon line, as it presents me with a degree of uncertainty echoed in the model's expression. In fact, you could probably argue that the weight of the wings tilt the image in some way. Add to that the dark shadows on the right side of the frame and now you're talking about some seriously deep symbolism. The framing and organization of the elements in this frame speak volumes for the photographer's commitment to excellence. Those eyes. They lock in and have you. The hair blowing around is telling me that the car is moving, and the window is down. The sun streaming through tells me even more about that day, it must have been warm. John Edgar says in his description that they were heading up to the cabin. If this picture represents the trip, I can imagine it was a fantastic experience. Sometimes the simple shots are the most effective. Unlike John's shot above, Ivor Sheehan's Out Of Sight required a very extraordinary location. I've heard someone say that when you see something that makes you say "Cool!" then you should be taking a picture. 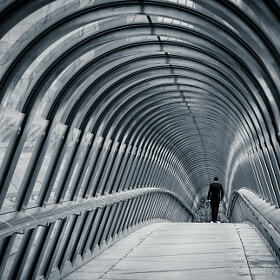 I absolutely love the geometry, leading lines and framing of this shot. The subtle black and white treatment of this shot helps to showcase the contrast and textures, and really keeps your eye focused on the man in the suit. This whole shot is out of sight, a simply awesome work. Go check out these photos and the rest of the photographer's works! In addition, go to 500px's Editor's Choice page. You won't be disappointed! Cheers! In "500px", "barca", "cafe", "choice", "edgar", "editor's", "ellen", "felix", "film", "ivor", "john", "kelby", "manuel", "photo", "photographer", "portra", "roser", "scott", "sheehan", "showcase"
Sometimes, a shoot just simply works, despite the conditions. Ellen and I met at the Dartmouth scenic gardens to do an impromptu photo shoot out in the snow. I was excited to work with her in preparation for another shoot I have planned in the following week. Kodak Ektar 100. Absolutely beautiful saturation! I brought along very minimal gear. This was going to be a meet-and-greet type shoot with minimal setup and hopefully lots of snowflakes. The snow turned to light rain the moment I arrived at the gardens. No problem, we'll persevere. I still had a dozen shots left on my roll of Ektar, so I used those up as well. I'd argue that those photos are my favourites from the shoot: they're more vibrant and deliver a more pleasing image than the digital ones, through no fault of Ellen. Kodak Ektar 100 again. The grain on this film is really really fine! I took quite a few photos with the 5D as well, though in hindsight I wish I had been a bit more dynamic with my lenses. I only used the 70-200, a lens which, while beautiful has been giving me a hazy look in my shots. I will be sorting that out soon! We spent about 45 minutes in the gardens before finally giving up hope on snowflakes returning to the scene. We headed over to a cafe to warm up which resulted in a few more images on film (but that roll is still in my camera, when I finish it up I will be posting a short review), but I'm very pleased with the results and I'm happy to have spent time with Ellen. She's a truly amazing person and is going places. In "5d mark II", "blue", "canon", "ektar", "elan 7e", "ellen", "eyes", "film", "hair", "hat", "jacket", "lens", "photo shoot", "pink", "portrait", "red", "scarf"